I'm reminded by Code Pink, and recent experiences, that nonviolent actors can use the color of their clothing to demonstrate solidarity and communicate meaning in symbol. Fernando told me I needed to wear white for the Peace Walk. We were in Monterrey, Mexico for a three day workshop on Gandhian nonviolence. The Walk was the last event of the workshop. Organized by workers at a local plant and supported by the community peace group Mesa de Paz, we were walking about two miles from one city center plaza to another, through the early evening traffic. All the white clothing I had were my undershirts, so Fernando brought me three shirts from which to choose. Little did I know that when we arrived at the meeting site, white T shirts with appropriate slogans would be passed out to all the participants. I ended up wearing three white shirts in the humid heat. I've been thinking about the symbolism of peace people wearing white clothing. White is the combination of all colors. We tend to associate white garments with divinity. Angels are always garbed in white, as is the Pope, as are Muslims on pilgrimage. And I began to recall other situations in other settings where white garb was the choice of nonviolent actors. I remember how moved I was by Joanna Macy's description of the Peace Meditation she attended in Sri Lanka in 2002. The meditation ceremony took place at 3 PM. 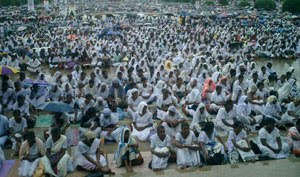 Members of the clergy of all the religions of Sri Lanka were gathered on a platform, and each said a few words. In front of them on a slightly lower stage, surrounded by flowers, was Ari. After the spoken prayers, he began to lead us all in anapanasati, mindfulness of breathing in and breathing out. The silence was the most exquisite sound I've ever heard. It was the sound of a half million people--actually it turned out to be 650,000 people-- being quiet together, in the biggest meditation ever held on planet Earth. I said to myself, "This is the sound of bombs not exploding, of land mines not going off, of machine guns not firing. This is possible." That is what I went to Sri Lanka to hear." Only this week, I watched the documentary "Pray the Devil Back to Hell." 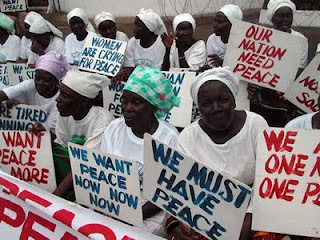 In it, the women of Liberia organize and act decisively to bring their war torn country back to its senses. The shirts they chose were white, with their organization and values printed on them. 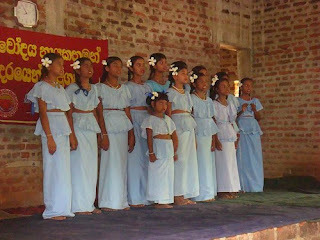 The sarvodaya movement in Sri Lanka speaks of a 500 year peace plan. Sometimes it helps to think long term. In the meantime, maybe I need to wear my Peace Walk shirts every day, wherever and whenever I walk.